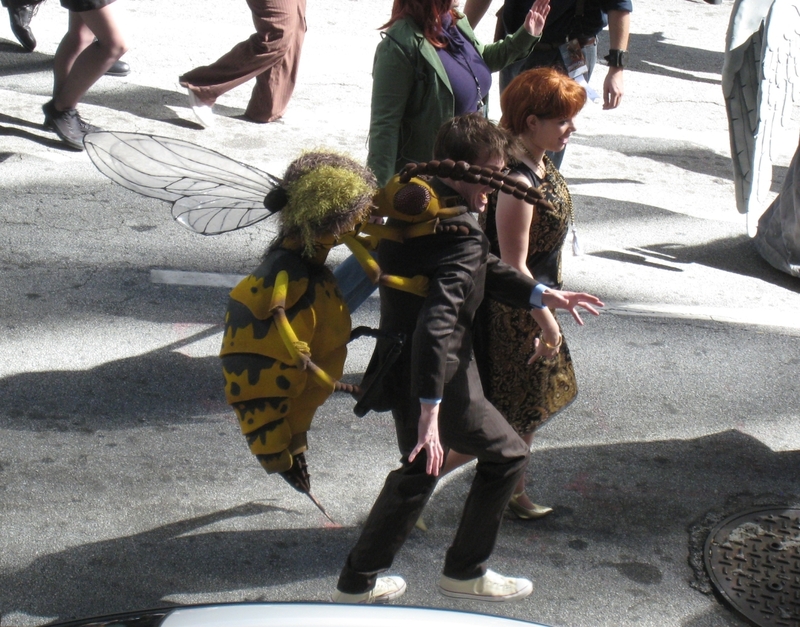 As I mentioned previously, this article will cover my top 5 favorite costumes from Dragon Con 2010. Before we dive into the list, I feel I should first mention what I look for in these costumes. Ah, yes, Harley Quinn. While there were many to be seen at Dragon Con, one particular costume caught my eye. She was portraying a specific version of Harley Quinn, one that I’ve only seen in a specific game: Batman: Arkham Asylum. Not only was the game exceptionally good, but it also made the character more realistic – it made me think she could very well exist. I was therefore pleased when I spotted this girl’s portrayal of Harley. She also struck me as particularly sinister-looking, which fit the part perfectly. Next up, here’s a version of Colossus that I really liked. The others I saw looked unrealistic, were portrayed by short guys, and were leaning more towards matching the comic book style. This guy went with a different approach, and in my opinion, outdid the others. When I first spotted him from a distance, it almost looked like he was truly made of metal – the fake light reflection in the paint job helped have this effect. When I approached him, I realized that he was a big guy, who was even taller than me… and I’m 6’4″. Sure, he has the boots to help him gain that height, but what it did was really give him a towering presence. The guy quite simply had the right physical build to dress like Colossus, and he backed that up with an excellent paint job. This guy was part of the parade, and I couldn’t help but laugh when I saw him. Funny, original costume – and he really does look like he’s being chased by a giant wasp. Unfortunately, I was unable to locate him afterwards- so all I have to show is this photo, which unfortunately isn’t from the best angle. UPDATE: Commenter “mandawho” points out that this actually a Doctor Who reference. As a guy who used to play World of Warcraft, I can easily appreciate this next costume. You see, in World of Warcraft, non-player characters offer you quests. You know they have quests to offer by looking for a yellow exclamation mark over their heads. 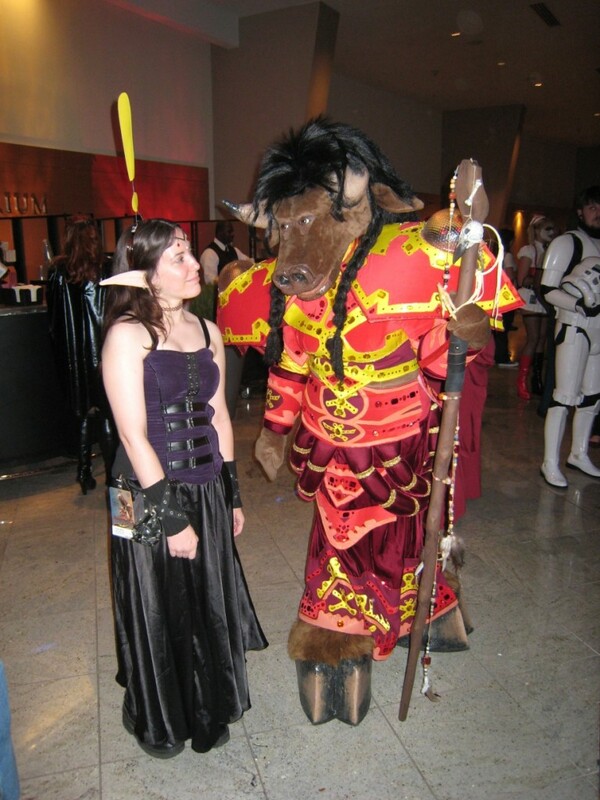 In the picture below, we see a Tauren speaking to Elven girl, who has a quest to offer. Both costumes are nice, but I especially like this photo in particular. It really seems like they’re in a conversation, right down to the body language. Set years after Alice’s Adventures in Wonderland and Through the Looking-Glass, the game features an older, more cynical and macabre incarnation of Alice. Back in 2002, a friend recommended I try this game. When I did, I truly began to understand what good game design was… which lead me to follow the work of American McGee himself, for many years. 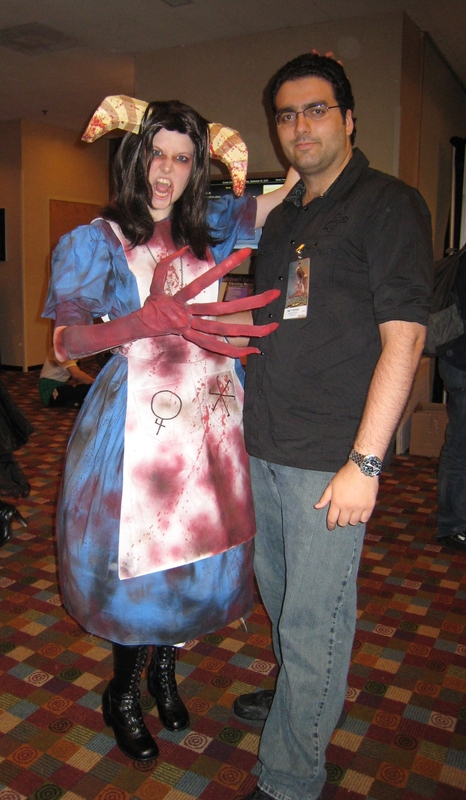 So, with that said, the girl below was not only dressed as American McGee’s Alice. Instead, she was dressed as a mutated form of American McGee’s Alice. This mutation occurs perhaps only 3-4 times throughout the whole campaign, and it happens when you find a specific “Ragebox” power-up. Anyone can dress up as American McGee’s Alice, and it could look cool… but her mutated form? Awesome. It really takes knowledge of the game to fully appreciate the costume, and think this girl did a particularly good job perfecting it. I was hoping to speak to her some more about the costume, but was unable to find her again. So, wherever you are – great costume. I really appreciated seeing such a specific reference to one of my favorite games. The gameplay video below will give you an idea of the game design, as well as what happens when Alice mutates. If you were listed in my Top 5, please feel free to contact me. I’m interested in hearing more about the making of your costume, and your general Dragon Con experience. I can be reached at mref…@gmail.com, or through the comment system on this blog. In my next post, I’ll be going over a few costumes that almost made this list, and also, I will make the best of my photos available for public viewing on Flickr.